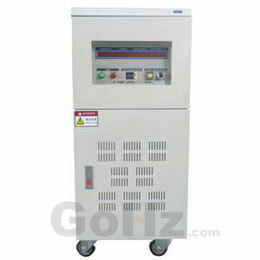 GoHz static frequency converter is a standard AC power supply electronic device, it can simulate international standard power supplies, convert fixed AC voltage and frequency power (50Hz, 60Hz) into stable pure sine wave power by internal AC to DC, DC to AC current rectifying, with high activation current, and displays a number of parameters (Such as: voltage, frequency, current, apparent power, power factor etc.). Fault code records, easy for troubleshooting. This was a modernization project whose part of the system was supplied by 3 phase. The new control module for that part of the system was changed to an electronic frequency converter being supplied by a single phase power and delivers a 3 phase output to a 3 phase motor rated at 1000w [1kw]. Now for every power interruption or outage, there is a breakdown of the whole system due to nuisance tripping of breakers supplying the single phase of this control module. Part of my recommendation is that we bring in a three phase control module, or a single phase motor of same rating or we find a way to reduce the starting torque of the three phase motor. Actually the pilot project done with a three phase control module is silent throughout its operation. Unfortunately for this one, there is every reason by the concerned parties that would not be the solution.